Who is that dancer with the orange hair? Is that the Italian girl who flees Peter Finch's garret early in the film? I really don't know what she's doing here. Looking for escapism in post-austerity Britain? 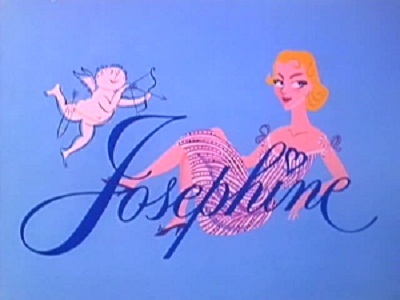 Emblazoned on the screen in all the colors of the rainbow, especially oranges and browns, Josephine and Men is a comprehensively innocuous comedy with very few laughs or attempts at laughs. Almost every joke in the first 85 minutes* is either a sight gag or something that depends on a musical cue. Neither the risqué romp suggested by the credits nor the social commentary suggested by the opening shot of Uncle Charles’s hangout, the “Parasites’ Club”, it’s the kind of romcom where the characters don’t step outside their archetype from beginning to end. 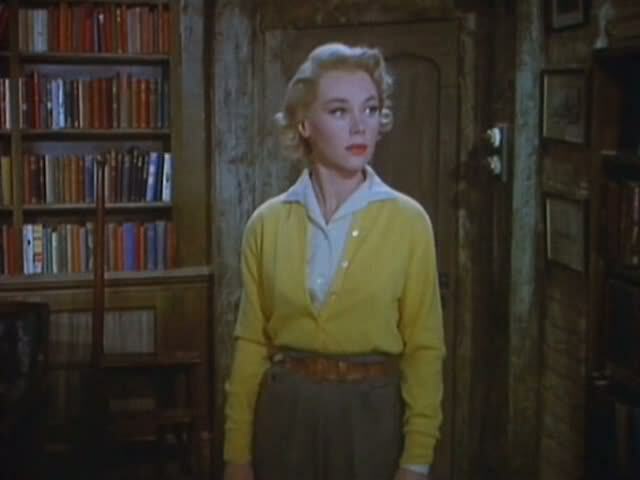 Wales’s glamour girl next door, Glynis Johns, has top billing as the titular protagonist, but it’s just as much of a vehicle for crypto-Scottish stage director/ actor/ producer/ boulevardier Jack Buchanan, who had recently been introduced to America at age 61 as the pretentious director in The Band Wagon. As Jo’s Uncle Charles he provides the narration and the framing device [like in the short story], and he engineers the happy ending through sage advice and Jeeves-style psychological machinations. Wikipedia describes Buchanan’s persona as “raffish eternal bachelor” and “debonair man-about-town”. During the movie I wrote down “cynical man of the world” and “elegant drunk”. He conveys this perfectly without interacting with a single woman except an elderly barmaid and his niece, who alternates calling him “Uncle Charles” and “darling”. His eyebrow work is tremendous. Uncle Charles: "There is one principle I have followed all my life. In all crises, do nothing. Absolutely nothing. Follow that principle, and you will invariably find it will all come wrong in the end." 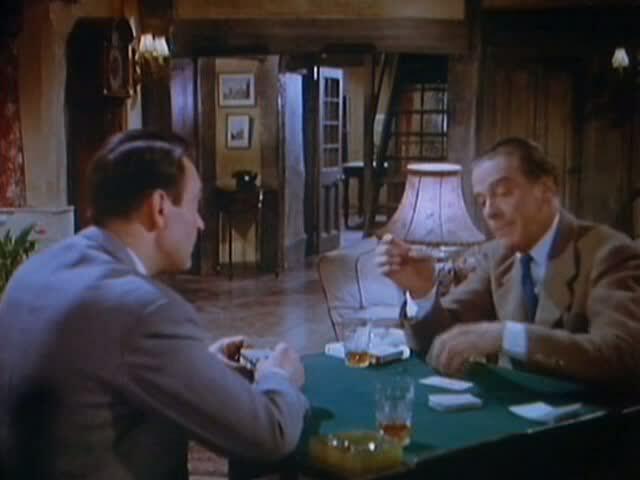 The Boulting brothers John and Roy had made several successful dramas and were moving toward satirical comedy by 1955, but this film is the merest trifle, despite being [unlike almost all their movies] in color. Nigel Balchin was a popular novelist and wrote respected thrillers and dramas including The Small Back Room. I think Jo&Men is his only comedy, based on part of this short story collection. It seems like Manchin created some inherently amusing/awkward situations and relied on the actors to do something funny with timing. 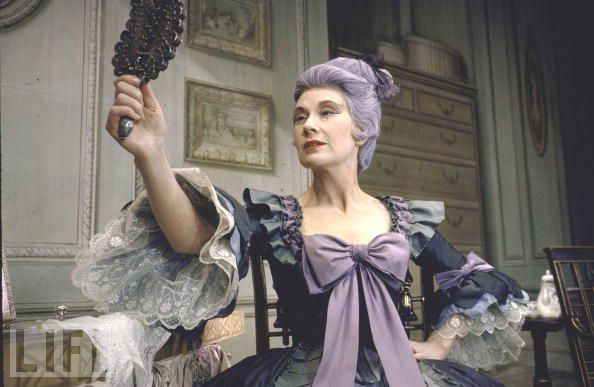 However, the actors act like they’re in an Oscar Wilde play, as if the lines are full of sparkling repartee and just need to be pronounced properly to work. The only person mugging for laughs is Tonie MacMillan as the housekeeper who gets incredibly annoyed by the cops hanging around. Buchanan makes wry reaction faces, but he talks in such a dry way that you don’t realize he’s the only one with any funny lines. Even the scene where he barks at an imaginary dog falls flat, although I’m sure it was a scream in 1955 Britain which had known his persona for 20 years. I’ve seen the young Glynis Johns before, but in more Princess Buttercup-type roles, like The Court Jester and Disney’s Rob Roy. Her voice is extra-breathy here, she looks vacantly pretty most of the time, and the resemblance to a Marilyn Monroe character is confirmed by her hairdo. The superficial dumblondery is deceptive, since the story is a commentary on the sort of woman who approaches everything, including romance, in the spirit of charity. Uncle Charles calls her a “one-woman Salvation Army”. As her suitors fall into disrepute and penury, her ardor increases. As her husband climbs the lucrative ladder of playwrighting, she becomes bored and dutiful, convincing him that he depends on her for every routine comfort. 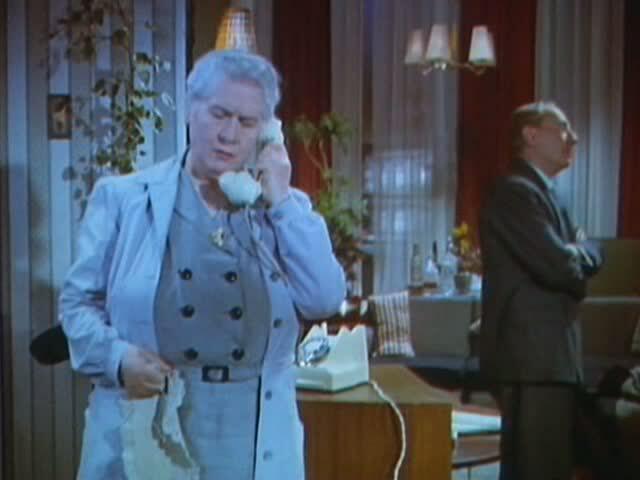 Although this Mrs. Jellyby of the boudoir could be a target for satire from the people who made I’m All Right Jack and Lucky Jim, this movie is about as satirical as A League of Their Own. It’s about escapism and minor foibles. As love interests, we have a 38-year-old but still obscure Peter Finch, and Donald Sinden, whose performance here does not suggest that he would become Sir Donald Sinden, one of British theater’s major figures and a member of the Royal Shakespeare Company for four decades. I can definitely imagine him as a snooty antiques dealer and a snooty butler in two long-running and critically derided sitcoms, as he was from 1975 to 1991. Here he’s the proper and upright stick-in-the-mud to whom Josephine inevitably breaks off her engagement so she can get with Peter Finch’s bohemian playwright. Sinden is given nothing to do, but he doesn’t try to do anything. This guy was “head boy and football captain”? This guy became a captain of industry within the five years or so that he and Josephine were out of touch? He appears to be a timid twit in a pencil moustache. I know it was acceptable for a badass to have a pencil moustache at that time, but this man very much falls short of that ideal. Finch is good as the irritable writer who does not change in any way when he goes from starving in a garret to success. He and the twit went to the same good school, and although people ask him doubtfully whether he has a tap in his flat [a huge studio with massive windows], they’re also surprised that he doesn’t own a top hat. The cast of weird characters in his apartment building is amusing [I liked the man in the bright yellow sweater frying a fish], though Jo&Men is missing the sort of in-depth dissection of the bohemian milieu you can find in A Bucket of Blood. "Ah, a sharp fragment of toast in the back." This writer character is close to being a chauvinist worthy of lampooning – from the first time we see him shouting at a mysterious signorina, to his settled cottage life of being vaguely jealous of his wife and letting his tea go cold so he can complain about it. But he’s not treated any more critically than the other characters. This film’s generous spirit and sprightly soundtrack makes it acceptable for turning your brain off and being cheered up. *Around the 85-minute mark Finch’s character gets smashed and has a blathering heart-to-heart with Uncle Charles. The drunk acting is really unconvincing and stagy, but this scene is hilarious. – This one’s a cert! It’s as safe as houses. – Well, they ain’t so safe these days. 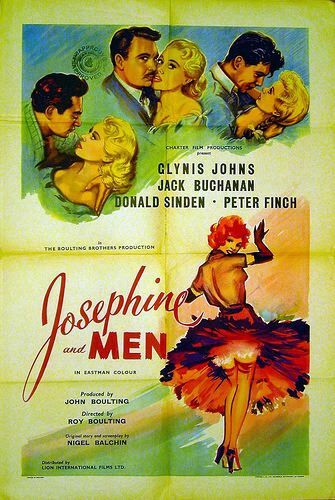 What with the sheer excitement of being the first person in Internet history to write about Josephine and Men, this piece has grown too long to address any other, better Boulting Brothers films [Heavens Above! and I’m All Right Jack, recently shown as part of Peter Sellers month]. Also on TCM late last year was a comedy about death and war, specifically the Blitz, made before V-E Day, which deserves notice for being more enjoyable and light-hearted than Jo&Men. The Bells Go Down is two things — an adaptation of Stephen Black’s popular, temporarily anonymous memoir of his time in the Auxiliary Fire Service, and a vehicle for rubber-faced, ever-smiling comedian Tommy Trinder. As both it does quite well. 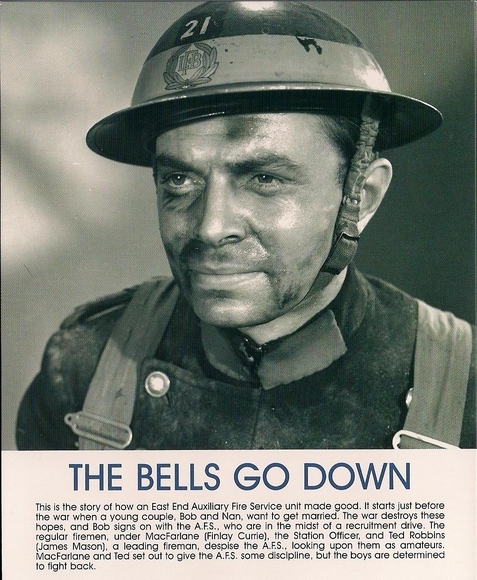 The Bells Go Down was among the last of Ealing ‘s wartime films to take the conflict as its subject – by 1943, the war was already on the turn, and the Blitz could be remembered with a tinge of pride, as an early challenge that was seen through with courage and fortitude. So the tone of the film, even though it allows for tragedy, is largely celebratory: a testament to the bravery and endurance of volunteer firefighters in the Auxiliary Fire Service (AFS). The AFS are portrayed as the ragtag conscripts [volunteers fleeing boredom, or the law, or romantic woe] to the London Fire Brigade’s professional pyro-troops. The rivalry between the two seems like it’ll be an underlying dynamic, but fades away. – Your old man told us you needed men in the Fire Brigade. – We’ve got men in the Fire Brigade — but they seem to be taking almost anything in the AFS. The ensemble cast works well together. We have Trinder as the fearless, carefree, lovable leering doofus Tommy Turk, Phillip Friend as the generic guy named Bob, Mervyn Johns [father of Glynis] as a small-time smuggler, and James Mason as Ted, the stoic, sincere and surprisingly hard-to-like LFB officer who’s tasked with whipping these misfits into shape. We see a lot of Ted’s parents and Tommy’s mum, and there are two strong, strong-jawed women: Meriel Forbes as Sue, who tempts Mason’s character Ted into learning to dance, and Philippa Hiatt as Nan, Bob’s generic fiancee. The film is punctuated by a vicar putting up banns … then throwing them away … then being confused at the sight of the couple back together again – with more emphasis on duty/loyalty to family and friends than to Britain. And the war disrupts the expected structures of family life more than it disrupts anything else…until the final climax of the Blitz, when blocks of homes are sacrificed so the firemen can save warehouses. Providing wartime cynicism and ennui is a Spanish Civil War vet named Brooks, a very underwritten character who should have been the narrator. Two interesting elements of this film are the slices of London life [pubs, docks, switchboards, Ma Turk’s fish and chips shop], and the fire scenes. 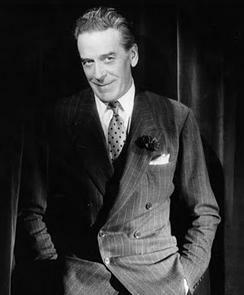 As far as realism and emotional honesty, The Bells Go Down was overshadowed at the time by Humphrey Jennings’s quasi-documentary Fires Were Started. But this film probably puts more effort into staging exciting fires. Backdrops, staged fires, and real footage of conflagrations are interwoven to produce some quite tense and up-close situations. Around Minute 36 there’s a startling shot looking up a 50-foot-high ladder, and scenes like the search for the delayed-action incendiary Brooks recognizes from Madrid are captivating. 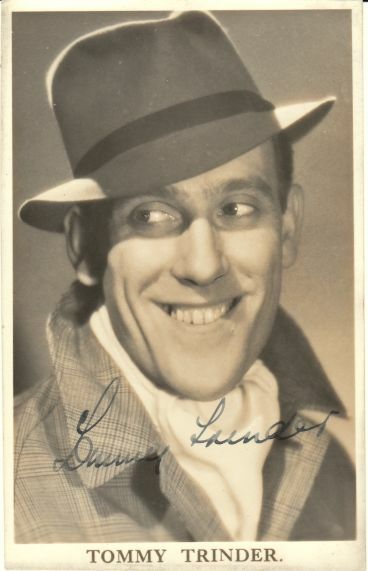 It’s a bit mawkish how all this is combined with Tommy Trinder’s vaudeville antics, but he doesn’t seem at all cynical or superficial in his enthusiasm. Switchboard Sue: You can’t do that! Tommy: Most people can’t, but I can. I’m different. Switchboard Sue: You’ll get me in trouble! Tommy [huge knowing grin]: Will I? After a year of romantic strife, family worries, ethnic stereotypes [the Italian guy is ridiculous, but I liked Lou Freeman the Jewish furniture dealer], training under a stern Scots taskmaster, and routine fires of increasing severity, London has gotten a bit overconfident about the extent of the Jerries’ advances — and the time has come for tragedy and sacrifice. It seems like the Blitz is over after two days, which is either rose-colored hindsight or a desire to not remind the audience of what they’d all experienced. But still, the characters know survival will be a challenge. It’s pretty presumptuous to criticize a movie like this for being manipulative. I laughed, I was saddened by the devastation, I was swept along by the action. And upper middle-class Nan and Bob show their appreciation of the working-class men they now know well from the fire brigade, by christening their son … not “Thomas” … but — shocking the vicar … “Tommy”. Click here to see Mick McCarthy emulate Trinder’s smirk. Update: A presumably-legal download site seems to have made Josephine and Men available as a series of .rar files, for some reason. And more importantly, included some probably-randomly-generated screencaps that I have now borrowed for this post.